Miami is home to some truly stunning architecture, with a tendency toward a combination of classic and contemporary design. 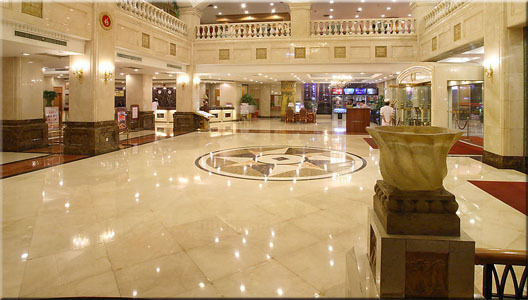 Natural stone tiles are frequently used for both the interior and exterior of commercial buildings. Marble is the preferred stone material for wall and floor coverings in government buildings and other public structures. A contractor bidding for a marble tile installation project – particularly a project for a large public development – wants the best deal possible on bulk quantities of natural stone. Buying in bulk will save money, but the quality of the material must meet or exceed the expectations of the contractor as well as the building designer. Locating a suitable supply of top-grade marble stone at any time of year means doing business with a direct importer and distributor. Stonexchange is located in Miami, Florida, and imports beautifully crafted natural marble stone tiles in bulk quantities. We feature our most popular products on our Nalboor Tiles website. Here, resale merchants and professional installers can view the materials, ask for an instant price quote, and set up a timely delivery of product to any address in the region. What sets our company apart from the competition is our ability to provide quality material at truly wholesale prices. Our low per-piece material cost is the result of direct fabrication, importation, and delivery of the natural stone materials we provide. When customers do business with Stonexchange, they are working with the actual manufacturer and distributor of the natural stone product. A public library, state or local government building, or other publicly financed structure often incorporates natural stone into the design. The idea is to give the building a look and feel that conveys a sense of stately grace as well as permanency. Such a structure may require as many as 10,000-20,000 marble tiles for the interior floors, and thousands more for wall coverings in bathrooms, conference rooms, and foyers. Although the bid for installing marble tiles may be awarded to a contractor several months before construction begins, the necessary materials must be located at the time the design is being contemplated by the person submitting the job bid. It is therefore imperative that a source of prime-quality material can be located and a wholesale price finalized at this time. Stonexchange solves the problem of both material source and accurate price quoting because we oversee the manufacturing and delivery of all our natural stone products. Our marble stone tiles are always available. Stonexchange does not purchase materials from an outside third party. We take customer orders, pass them on to our importation department, and have the material fabricated and shipped to our distribution center right here in Miami. This means that our warehouse is always stocked full of each style of product we showcase on our Nalboor Tiles website. Medium-sized orders can be processed with inventory already on hand. Larger orders must be imported by the container load and delivered to our warehouse or to the customer’s job site. Large development projects such as a public building are no problem for Stonexchange because we can have the entire order ready for delivery on or before the scheduled construction phase. If the order is large enough to warrant special fabrication and container delivery from overseas, a lead time of up to two months may be required. This should not be a problem for installers bidding on public development projects because the price quoted months ahead of time is quite reliable, and the product delivered will exactly match the building instructions. All our marble tile varieties are available year-round. We produce marble tiles from the same quarries that yield material for our popular thresholds, countertop blocks, and window sills. The customer can rest assured that the color and patterning of our stone tiles will exactly match the samples shown. Most of the popular color shades and patterns of marble tile indicated by their industrial names are duplicated by our company’s own selection. Even the very largest of order requests for natural marble stone can come with a high price tag. This inflated cost may not be immediately noticeable when the first delivery arrives at the job site. However, many suppliers and resellers of marble tile are not affiliated with a distributor or importer guaranteeing timely delivery or perfect color match. This is because many importers do business with several different tile manufacturers located overseas. The supply of certain marble varieties may dry up from time to time because of large orders placed by competing customers. When it comes time for the contractor to order material for the subsequent phases of the construction project, the price may have changed or the exact color match may have become unavailable. Now the contractor is in a real bind. He or she must shop elsewhere to find the rest of the tiles needed to complete the job, and on such short notice there is no guarantee that the remaining orders will keep the job on or below budget. This is why Stonexchange is the preferred source for natural stone materials in Miami and throughout the southern part of Florida. Our company imports and distributes all types of marble tiles. We maintain a full inventory of marble tiles at our distribution center in Miami. If the inventory begins to drop because of numerous orders placed at the same time, we simply import more container loads of the same color shade and style of marble. We therefore price our materials according to the size of the order placed by the client. The more tiles ordered, the lower the per-piece cost. For full-crate or full-container orders, the price for our popular marble tiles is amazingly low. This gives the contractor a cost-saving alternative when the job at hand requires thousands of tiles. Building instructions often call for the use of a particular shade of marble. In Miami, both light cream and off-white marble streaked with tan or gray has been popular for many decades. Equally popular is the slightly darker beige marble varieties, usually known as crema marfil. Our white marble and cream/beige varieties perfectly match and replace nearly every building design instruction calling for these shades. Our beautiful Bianco Dolomiti is an off-white shade with fine gray streaking. This product perfectly replaces Calacatta Gold or Bianco Venatino. The tiles are expertly crafted, available in several different sizes, and are priced well below retail. Bianco Dolomiti is very similar to our Nuevo White Carrara marble products and can be used in projects calling for Cherokee, Georgia, or Vermont marble. Our Vanilla Oro marble tiles are ivory/cream with moderate streak patterns, This tile is exceptionally smooth and has moderate reflectivity. Similar in shade is our Nuovo Crema Marfil, a light beige tile that resembles Bursa Beige or Botticcino. We also carry Rojo Alicanti, a darker reddish marble tile that works exceptionally well as a complementary accent material. Another popular project from Stonexchange and Nalboor Tiles is Crema River, a light mocha shade marble tile that has lower reflectivity and works as a beautiful neutral shade in brightly lit indoor environments. Regardless of how low the price is on bulk orders of natural marble stone, quality remains the key for installers and property owners. In the case of a public project development, lasting value is a vital concern. If the public is paying for the structure, the structure had better be built to last. The finest quality natural stone products available today are found in the Stonexchange distribution center in Miami. We pride ourselves on operating manufacturing centers that use the latest and most advanced cutting and shaping equipment in the industry, and we use only the very finest material from the quarry locations of our choice. The result is the best materials at truly wholesale prices. If you are a construction company, flooring company merchant, or an independent installer looking for fantastic deals on bulk-quantity natural marble stone, look no further than Stonexchange. Our Nalboor Tiles website showcases the finest marble at the lowest possible wholesale prices. Contact us today and find out just how low our prices are on large orders of premium quality stone materials. Remember, we stock our warehouse year-round, and our rapid shipping of full-crate or full container loads of marble is just another part of our personalized service. Light Grey marble from Italy with darker grey veins. It’s a classic stone, never old. Blends in both modern and classic projects.